With the release of Windows 95, Microsoft leveraged its Windows PC software licensing agreements to push vendors to bundle licenses for Office 95 and Schedule+ with new PCs, a move that wiped the leading Lotus Organizer off desktops and into obscurity. After IBM purchased Lotus Development in 1995, Microsoft was found to have "punished the IBM PC Company with higher prices, a late license for Windows 95, and the withholding of technical and marketing support," according to the findings of fact in the United States vs Microsoft case looking into its PC monopoly. As noted in Office Wars 4 - Microsofts Assault on Lotus and IBM, Microsoft had long been telling its DOS partners to port their applications to OS/2, which helped ensure that its own Office suite would be the only software available when Windows 95 shipped. As a result, Microsoft rapidly transformed itself from a Mac developer into the leading vendor of PC applications within just a few years. Microsoft halted development of Office on the Mac in 1994, and Apple's platform subsequently began to fall behind. By 1996, all of the momentum in the PC industry had shifted behind Windows and Microsoft, leaving the Mac with an aging portfolio of productivity applications. 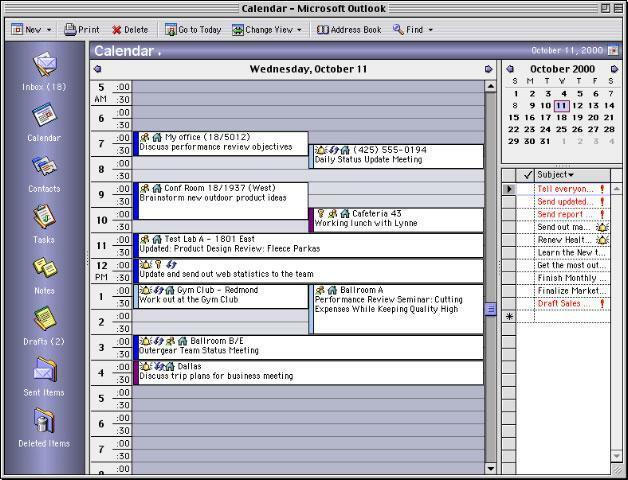 In 1997, Microsoft replaced its standalone Schedule+ calendar with a combined PIM application that merged email, calendaring, notes, tasks, and contacts into one application: Outlook. Unlike Claris Organizer, it also incorporated a file viewer (below). In order to pull Apple out of its death spiral, one of the first things Steve Jobs did after his return to Apple in 1997 was to kill everything that distracted from the goal of restoring the company's health. Among the casualties were the aging applications of its Claris subsidiary. Claris Organizer was sold to Palm in 1998, which resold it as Palm Desktop 2.0 in order to improve Mac support for its Palm handheld organizers. Apple also scuttled the popular Claris Emailer. 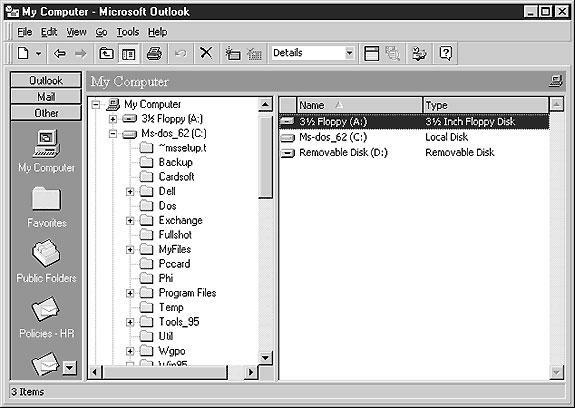 Jud Spencer, its lead developer, went on to Microsoft's Mac Business Unit to work on Outlook Express and later Entourage, which took over as the Mac version of Outlook after Microsoft's Exchange group canceled Outlook for Mac (below) in 2001. The reason behind the move is explained in the posting Why did Microsoft replace Outlook for Mac with Entourage? Just prior to shutting down Claris, Jobs negotiated with Microsoft to deliver a new Office for Mac, which was released in 1998. It's not publicly known if Microsoft had any say in the dismantling of Apple's Claris applications or if those apps were simply not worth maintaining by that point. However, it is interesting to note that Jobs originally launched Microsoft into the application market when he invited the company to develop for the Mac in 1982. Then, after Microsoft packed up its popular Mac applications and migrated them to the PC with Windows in 1991 (and abandoned the Mac in 1994), Jobs brought Microsoft back to the Mac and got it to deliver Office 98, Internet Explorer, Outlook Express, and later Entourage. During that period from 1998 - 2002, Apple was struggling to deliver its new operating system and rebuild the Mac platform, and would have been hard pressed to also deliver a suite of desktop applications on its own. After Apple shipped Mac OS X 10.2 Jaguar as the first mainstream release of its new operating system in 2002, it began work on developing a series of its own desktop productivity applications. One of the first was iCal 1.0, which was offered as a free download for Jaguar users later that same year. The new iCal was unique in that it was not developed at Apple's Cupertino campus, but rather by a group of Apple employees in Paris. The French iCal development team was led by Jean-Marie Hullot, who years earlier had approached Apple with the idea of object-oriented interface development in the late 80s. While the Mac's graphical interface was easy to use, it was not easy to develop applications for it. Hullot devised a system called Interface Builder for creating a palette of interface elements which could be graphically arranged, then attached to functions. Apple's Jean Luis Gassée invited Hullot to travel to California, but he quickly decided he didn't want to work for Apple. Instead, he shopped his idea around and ended up demonstrating Interface Builder at NeXT, where Jobs hired him immediately. Interface Builder enabled rapid development on the NeXTSTEP platform, helping to fuel developments such as Tim Berners-Lee's World Wide Web. Hullot also worked on the Application Kit frameworks of NeXTSTEP. After Jobs returned to Apple years later, he invited Hullot to work on a scheduling application using a modern version of Interface Builder and the frameworks he had earlier developed to make application design easy. 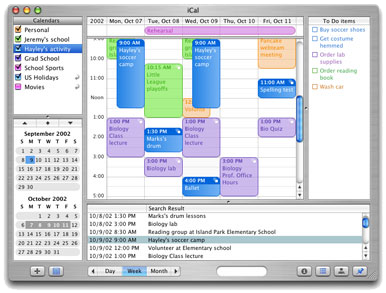 The release of iCal 1.0 (below) demonstrated that complex applications with innovative user interfaces could be developed rapidly on the new Mac OS X. It pioneered the concept of displaying the events of multiple calendars together in the same view. It made it easy to publish calendar data to other users or subscribe to shared calendars on the Internet. It also incorporated AppleScript support and could easily import data from other applications. Apple supported the iCalendar format for sharing calendar data between systems, which had been developed by OpenText, IBM's Lotus, and Microsoft to promote interoperability in communicating free/busy time, processing invitations, scheduling events, and handling to-do lists. Shortly afterward, Apple released iSync for synchronizing calendar and contact data with mobile phones and Palm devices. By 2004, Palm had abandoned development of its Palm Desktop software, focusing instead on syncing with Outlook under Windows. Apple's move to deliver its own sync solution not only kept the Mac platform afloat in the wake of Palm's jumping ship, but also paved the way toward the development of the iPhone. For Leopard, Apple pulled its iCal development in house, and paired its iCal client with a new calendar server. Rather than trying to develop a monolithic groupware system that integrated calendaring into an email server and directory services, Apple built a standalone calendar server based on the open CalDAV specification. It also announced plans to release its calendar server as an open source project in the same pattern as the Apache web server. This strategy allowed Apple to focus specifically on the demands of a calendar server, rather than delivering a single product with a wide scope attempting to do a little bit of everything. It also offers the open source community an alternative to emulating Exchange Server. By offering a standards compliant CalDAV server under the Apache license, Apple can use the best existing email server while also sharing its calendar server to the community and Linux administrators, encouraging the adoption of CalDAV. On page 3 of 3: Leopard's iCal 3.0; iCal Server; An Open Agenda; Lotus Notes, Symphony on Leopard; and I'd Like to Exchange This.